Amada aka Hank was born on Aug 1, 1898 in Chicago, Illinois and he died on Jun 9, 1969. He and my grandfather were very close. He’d visit us often in Villa Park when I was young. He was always soft spoken and kind. Hank was married to Anna wo was born in 1915 in New Jersey and he had a daughter named Kathleen (Cookie) who was born in 1940. 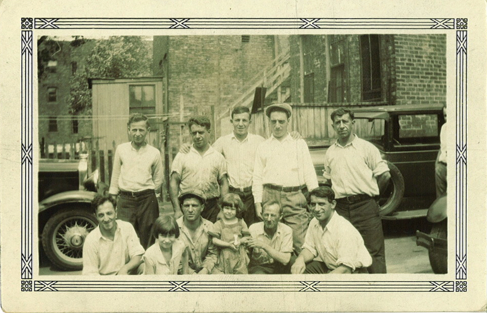 This photo was taken in the alley behind the music store on Harrison Street. If anyone knows the other people in the photo, please let me know. 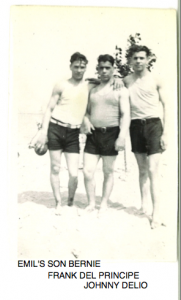 During their correspondence Joe and Salvatore discovered that they are relatives on the Ciolli side of the family! 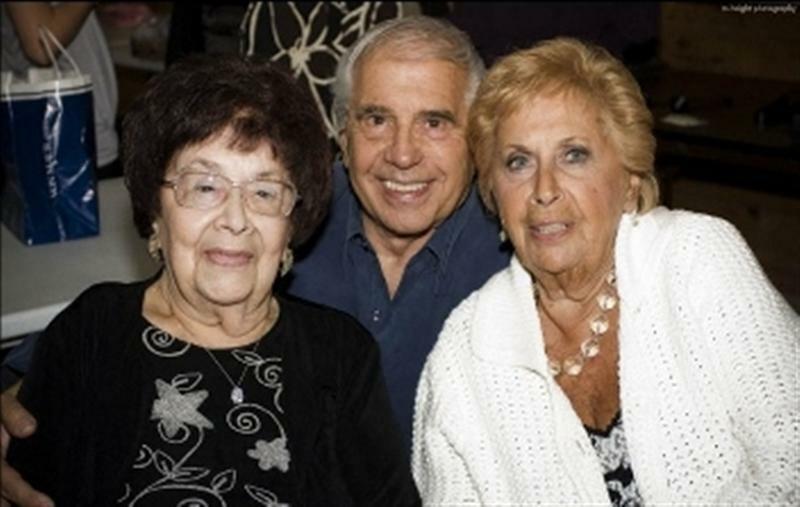 Joe’s grandmother Elvira Ciolli Del Principe and Salvator’s great grandmother Ester Ciolli Saltarelli were sisters. 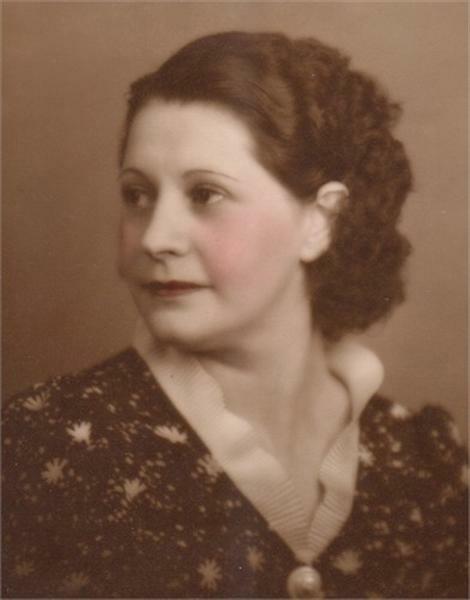 Ester and her husband Francesco Saltarelli had 5 children: Carmela, Amelio, Maria, Paolo, and Angelo. 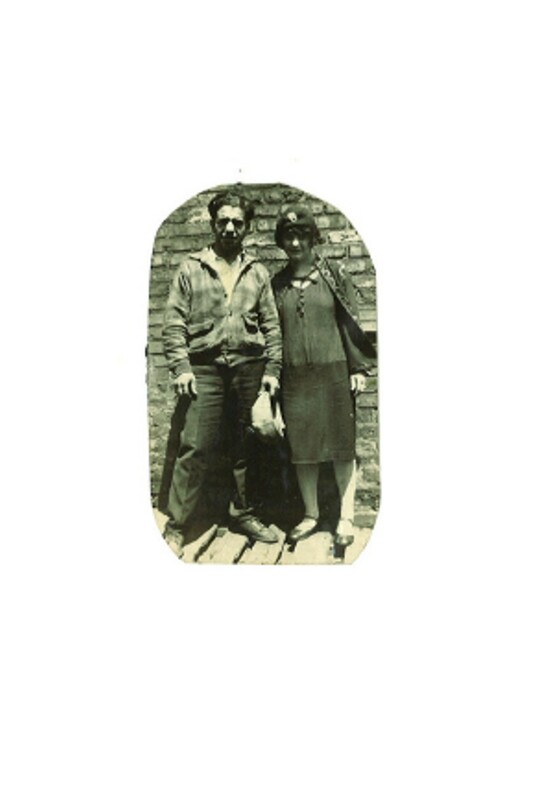 Paola immigrated to the US aboard the S.S. Duca Degli Abruzzo on April 1, 1920 and settled in Detroit Michigan. Amelio immigrated in March of 1914 and lived in Chicago, Detroit, and Ann Arbor Michigan. Ester died when her children were very young. Salvatore’s grandfather Angelo Saltarelli was just 5. 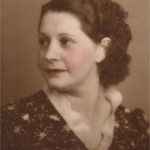 Angelo Saltarelli married Ines Pistilli when he was 25. He was a Shepherd like his father Francesco. He would follow the livestock during the winter to Apulia and in the summer on the Pescasseroli mountains. After he was married he and his father worked for the same employer building roads. In 1937 he left for the then Italian colony in Africa – first Libya and then Somalia & Ethiopia to build roads. In 1941 he was captured by the British army (even though he was not a soldier) and sent to a Raf camp in Uganda on Victoria Lake. In 1945 he was taken to Glasgow Scotland and finally in 1948 he was set free and went back to Pescasseroli. He did not see his family for about 11 years. Angelo had 5 daughters, the eldest is Salvatore’s mother Ester who was born in 1931. The other daughters were: Benedetta born in 1933, Zelia born in 1935, Anna born in 1937, and Franca born in 1950. Angelo had to wait 11 years to meet Anna. Ester married Arnaldo Toscano and they had a son named Salvatore. 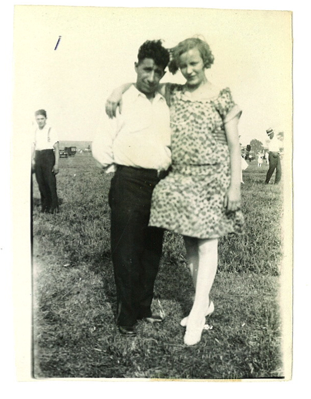 Click here to look back in time at our family tree. You will see that another member of the Saltarelli family married a Del Principe back in 1789 when Mattia married Maria Scholastica Saltarelli. 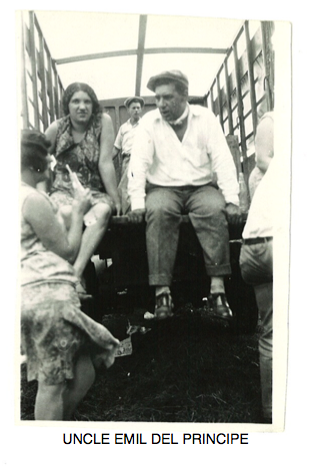 Salvatore told us that he recently spoke with a woman who is a direct descendent of the Ciolli family. Her name is Ofelia Vitale and her grandfather was Florindo Ciolli, Ester & Elvira’s brother. 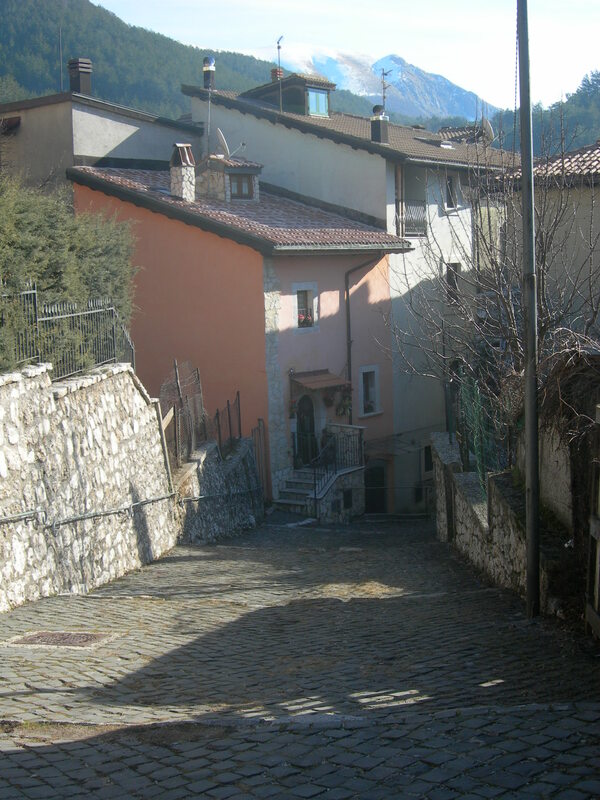 She lives in the house in the oldest part of Pescasseroli that was the dwelling of Elvira and her family. A whole block seemed to belong to the Ciolli family. Salvatore remembers some of the stories that his grandfather Angelo, Elvira’s sister Gemma, and Ofelia have told him over the years. Ofelia remembers that during the second world war the times were very hard. 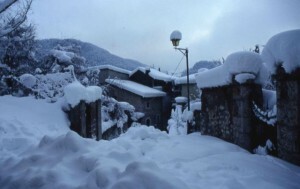 American relatives helped the family in Italy by sending parcels to them. Elvira’s father was Pietrantonio Amabile Ciolli. He was the town’s Apothecary (pharmacist/chemist). 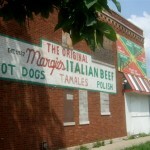 His wife Filomena Ursitti was a property owner. Amabile and Filomena had about 17 children. One of the children was a priest at Pescasseroli’s parish. During one of her research project’s Kathy from GenTracer discovered that the 1854 marriage record shows the title “Don” before the name of my great great grandfather Pietrantonio Amabile Ciolli. I asked Kathy about this and she said “Don is a title, as is Donna. It is usually applied to landowners and is the top of the social strata in a town, topped only by a title (Baron, Duke, Prince, etc)”. 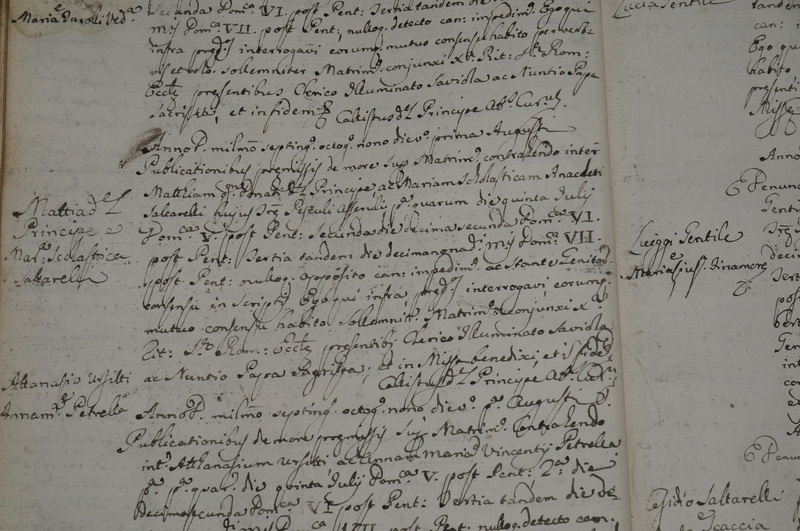 Also, the 1828 marriage records of Raffaele Ciolli states that Raffaele’s father Medici Carmine’s occupation is a doctor. 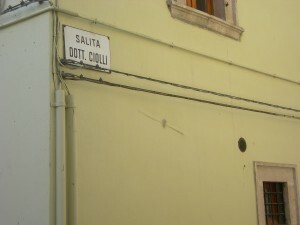 There is a sign hanging on a building leading to the Ciolli home that says “Dott (Dr.) Ciolli. Does this sign refer to Dr. Medici Ciolli or to Pietrantonio Amabile Ciolli? Salvatore told me that many people from Pescasseroli left for the United States the same time my great grandparents did. 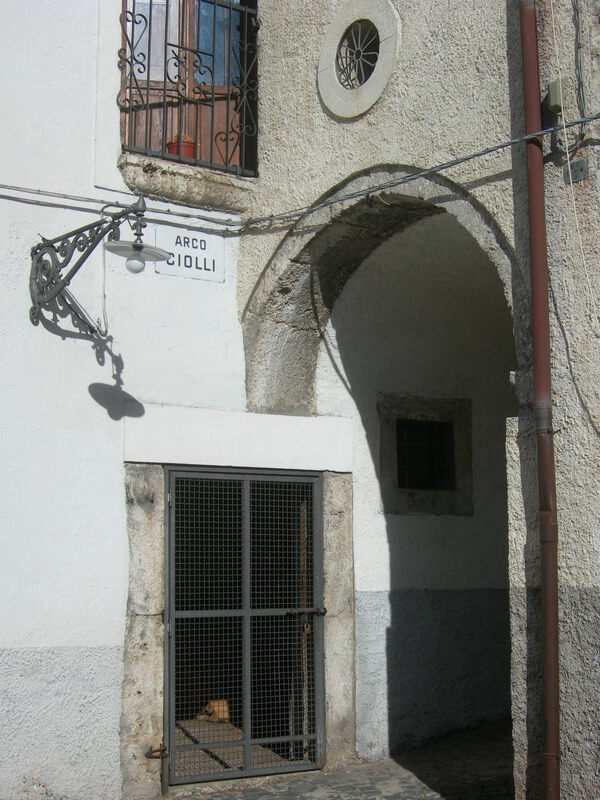 A lot of the town folks abandoned the Catholic religion to follow a popular Protestant group in Southern Italy. The town split in two and there were many arguments about important issues such as education. The Bishop sent some missionaries to intervene and in the end they defeated the Protestants. Most of the Protestant people left for America. They may have gone of their own free will, or they may have been pressured to leave. Salvatore relays this story from a very important Historian/Philosopher named Benedetto Croce born in Pescasseroli in 1867. Thank you Joe for linking us to our new friend. 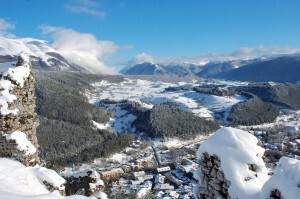 Thank you Salvatore for the wonderful photographs and all the information. I hope to communicate with Salvatore again to learn more about the Ciolli side of the family. When you are interested in genealogy you learn to network with as many people as you can. One way to network is to join genealogy forums. This is how I met Gina. She was looking for relatives of the Del Principe family of which she is a distant relative. Gina and I exchanged several emails over the summer. She told me she wrote letters to people in Italy with the last name of Del Principe to see if she had a relation there. I contacted her again in December to ask if she had any success with her letters and she said yes – she gave me the email address of Giovanni Del Principe. I am so thankful for her assistance. She gave me access to a treasure chest! Here is a photo taken in 1997 of Giovanni’s brother, Mariano Del Principe. 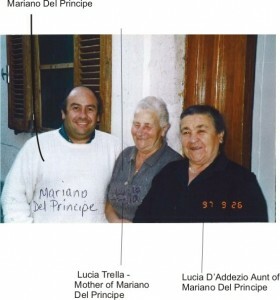 In the center is Giovanni’s mother Lucia Trella. 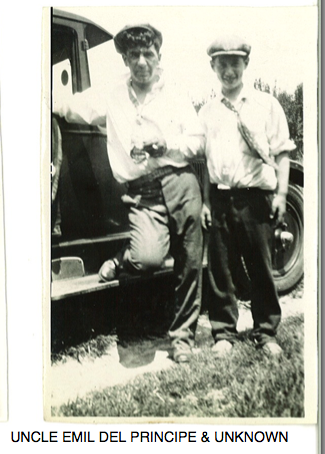 His aunt Lucia D’Addezio is on the right. Thanks to Giovanni I now know Pietro’s middle name – Giovanni. And I know that Pietro had other siblings besides Maria Domenica. Vincenzo was born in 1830, Maria Domenica was born in 1833, Lucia Carmela was born in 1836, Antonio was born in 1837, Gerardo was born in 1846, Maria was born in 1849, and Pietro Giovanni was the baby of the family. Pietro’s parents were Gaetano Cesidio Del Principe (born in 1799) and Anna Maria Boccia (born in 1808). Gaetano’s siblings were Donato born in 1796, Francesco Mattia born in 1802, Michelangelo born in 1806, Giustino Gennaro born in 1835, and Domenico Leonardo born in 1808. Gaetano’s parents were Mattia Del Principe (born approx. 1769) and Maria Scolastica Salterelli. Mattia’s father was Donato Del Principe (born approx. 1744). 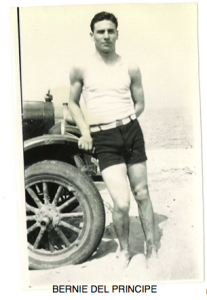 I am related to Giovanni by a common thread that dates back through Donato Del Principe. This is an image Giovanni sent me of a registration to marry. I believe the names Mattia and Maria Scolastica Saltarelli appear in the left column. They were married on Aug 1, 1789. The following information and photos were sent to me from Giovanni and the text was in Italian. I have used Google translator and this is what I believe his email said: “The use of surnames is initially a prerogative of the richest families. Between the thirteenth century and the fourteenth century, the family name began to be used even in the lowest social strata. 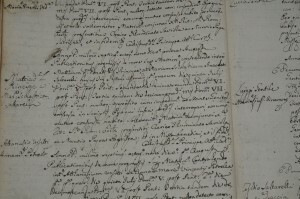 The Council of Trent, 1564, the Catholic Church requires priests to manage a register of baptisms with your name, in order to avoid in breeding. In addition to the register of baptisms, registration of marriages and deaths was recorded. 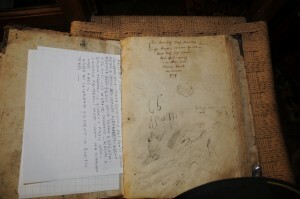 The church organizes a “Register of souls” , the census was to be organized much later. Giovanni tell me: “The search for records is difficult because the books and records are in poor condition. It is difficult because everything is written in Latin. 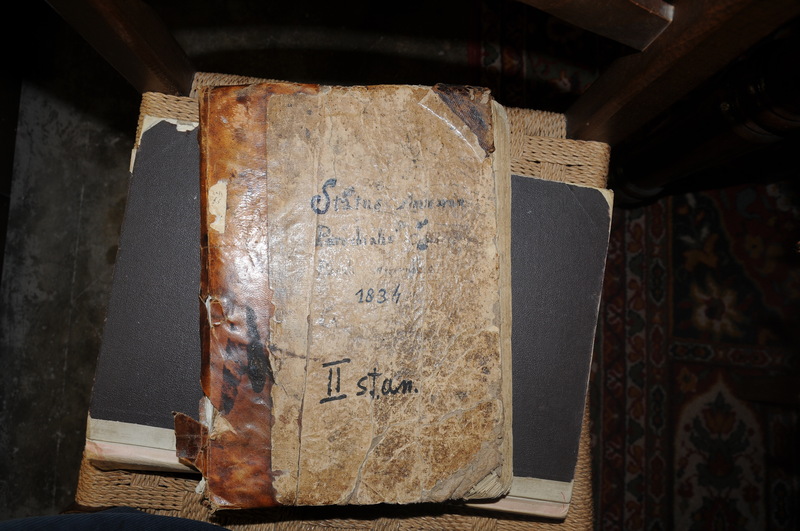 But books are a rich source of information because in the baptism records are parents and grandparents names. 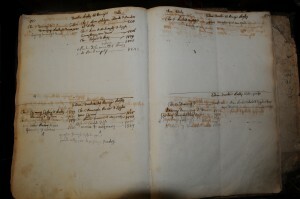 On the page of the Register of Souls in 1834 it describes the neighborhood where the family lived and Mattia Del Principe had many sons and daughters at the time of 1834. This is a photo of the church where our family records are stored. 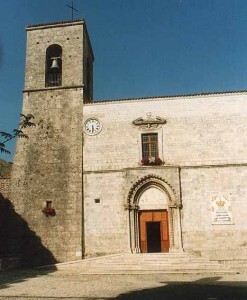 It is the Abbazua di SS Pietro e Paolo a Pescasseroli church. It was founded in 1100. Inside the church there is a wooden statue of the Madonna and Child dated to about the thirteenth century. I can never thank Giovanni enough for all his research and information. I have made a wonderful new friend. He is my hero. I can now document my Del Principe ancestors 6 generations back!